Demand response and energy efficiency programs are complementary: energy efficiency reduces both energy use and peak demand while demand response provides additional peak demand reductions. In this blog, we use data to illustrate the importance of each, including some new data on actual savings from demand response programs. For more than 20 years, ACEEE has been taking a close look at the energy savings from utility-sector energy efficiency programs. In 2015, we estimate that these programs saved about 200 billion kWh, more than 5% of retail electric sales in the United States that year (based on an analysis of data through 2014 and updated to include 2015 savings). In some leading states, the savings from these programs exceed 10% of retail electric sales already and could reach more than 20% by 2020. These energy efficiency savings also substantially reduce peak energy demand---the time of the day and year when the demand for electricity is highest. For example, we recently reviewed data reported to the US Energy Information Administration (EIA) on energy and peak demand savings for 25 program administrators (those reporting the highest total energy savings in 2015 and that together account for more than half of incremental energy savings in 2015). We found that for each 1% reduction in electric sales for a utility, on a median basis, peak demand reductions from efficiency programs are 0.66% of peak demand for that utility. If these trends hold for additional utilities and future years, it would mean that for a utility that reduces retail sales by 15%, the peak demand savings will be around 10%. These energy savings and peak demand reductions from energy efficiency programs help reduce system costs and avoid outages. Still, many regions face challenges meeting peak demand. This is where demand response comes in. Demand response refers to the various strategies used to reduce loads during peak periods, and shift these loads to periods with lower power demand. Demand response includes a wide variety of strategies including interruptible rates, air conditioner and water heater cycling programs, and pricing programs such as peak time rebates. In a variety of prior studies, ACEEE has estimated that demand response programs can be used to reduce peak demand by 10% or more (for example see our studies on Ohio and South Carolina). These savings are above and beyond the peak savings from energy efficiency programs that we discuss above. Now that utilities have been running demand response programs for a decade or more, we can assess how much these programs actually save. We looked at energy efficiency and demand response savings data for 2015 (the most recent year available) collected by the EIA, a branch of the US Department of Energy. For demand response, EIA collects two types of numbers – potential and actual reductions measured in megawatts (MW). Potential peak demand savings refers to the total demand savings that could occur at the time of the system peak hour assuming all of an individual utility’s in-place demand response strategies are used. Actual peak demand savings are demand reductions achieved by demand response activities, measured at the time of the company’s annual system peak hour. Actual savings address the fact that many utilities did not activate all demand response capability in 2015. We looked at all utilities that reported potential demand response savings of 200 MW or more – a total of 28 utilities. These 28 utilities represent 64% of the potential demand response savings reported to EIA, and 58% of the actual reductions reported to EIA. For these 28 utilities, we found that potential demand response savings ranged from 2-27% of the utility’s peak demand, with 10% peak demand savings being the average. Of the 28 utilities, 59% reported potential peak demand savings of 10% or more. Data on the top dozen utilities are reported in the figure below. Actual demand response savings ranged from 0%-24% of utility peak demand, with an average of 4%. 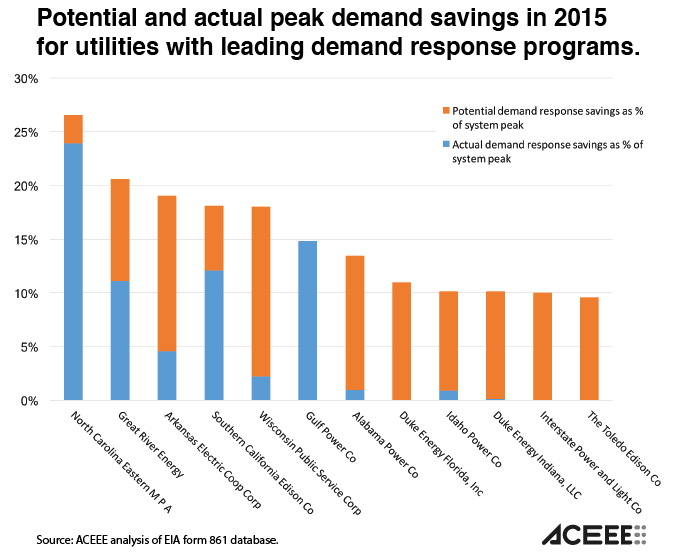 Four utilities reported actual demand response savings of more than 10% of their peak demand. Only two utilities reported actual reductions equal to 100% of their potential demand reductions while eight of these utilities either reported zero actual savings or did not provide actual savings data. Of the 25 utilities providing actual savings data, 10 used at least half of their available potential reductions. These data are reported by each utility to EIA and may contain errors. We did delete a few utilities for which there were obvious errors (a few utilities reported demand response savings in excess of their peak demand!). Further exploration of these data would be useful, such as a better understanding of why some utilities used most of their demand response resources and others very little. For example, utilities that are long on capacity are probably less likely to call much of their available demand response resource. Still, this initial analysis does illustrate that utilities with extensive demand response programs can achieve reductions of more than 10% of system peak if they choose to use these resources. You can find the data on the 28 utilities with potential demand reductions of 200 MW or more here.